SAN LUIS OBISPO — Cal Poly agricultural business junior Jose Alvarez won second place in the business pitch contest at the recent national Minorities in Agriculture, Natural Resources and Related Sciences annual conference in Jacksonville, Fla.
Alvarez, from Santa Maria, Calif., was selected from more than 50 applicants nationally to give his business pitch — patterned after the television show “Shark Tank” — to three industry judges. He proposed developing a nonprofit or cooperative organization to support the H2A visa program for farmworkers in California while also ensuring a labor force for small farmers. He received a plaque and a cash award. Cal Poly agricultural science senior Angelica Aldana, from Bakersfield, Calif., was elected to national office. She will serve as a regional vice president starting May 1. Agricultural science students Veronica Lemus, of Santa Paula, Calif., and Yessica Hernandez, Santa Maria, Calif., presented a poster titled “Experiences and Perceptions First Generation College of Agriculture Students Have of Higher Education,” in the undergraduate research poster contest. MANRRS is a national society that welcomes membership of people of all racial and ethnic group participation in agricultural and related science careers. 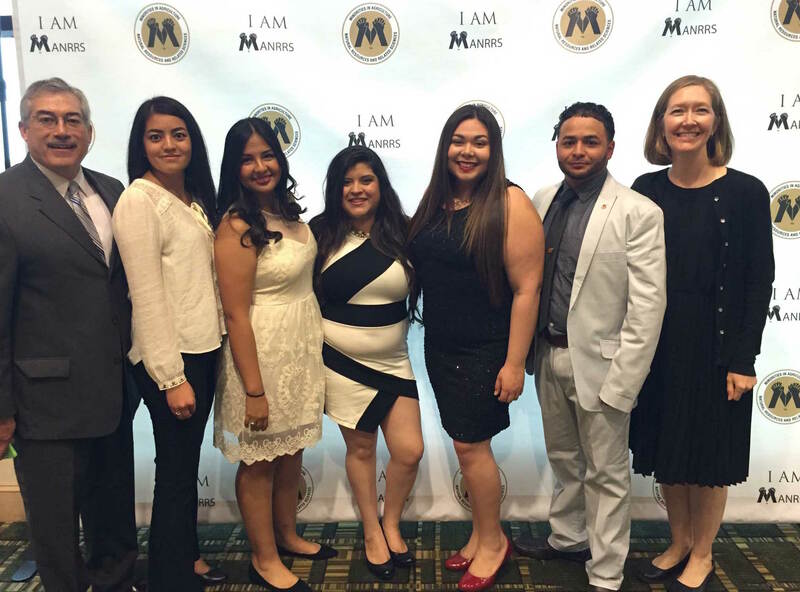 For student members, MANRRS provides role models and networking opportunities. MANRRS also offers students opportunities to enhance leadership and organizational and public speaking skills and to experience professional critique of scholarly work in a “user-friendly” environment. (Left to right) Cal Poly Agricultural Education and Communication Department Head Robert Flores, Veronica Lemus, Samara Guerra, Yessica Hernandez, Angelica Aldana, Jose Alvarez, and Professor Ann De Lay.